In a large bowl, combine water, oil, sugar, skim milk powder, salt and yeast. Mix until well blended. Add in a cup of flour and beat with a wooden spoon or spatula until smooth. Add in another cup of flour and do the same. Sprinkle half a cup of flour on a counter and pour out dough on top. Begin to knead and slowly add in more flour until the dough no longer sticks to the counter. Knead for 10-15 minutes. Spray a large bowl with cooking spray and place dough in the bowl, turning to coat. Cover with plastic wrap and let rise one hour or until doubled in bulk. Place risen dough on a counter. Cut in half with a bench scraper or pizza cutter. Flatten out one of the pieces using your hands. Roll out into a 9 x 14 inch rectangle. Spread 1 tbsp of the softened butter on top. Sprinkle cinnamon and sugar on top, enough to make an even coating (more or less to taste). Bring in the long sides by half an inch and roll the dough like a jelly roll, careful to keep sides tucked in. Pinch seam closed with slightly wet fingers. Take a bench scraper or pizza cutter and cut jelly roll down the center lengthwise. Open the jelly roll exposing the inside. Take the two pieces and braid them together, cut side always facing up. Place the bread in a 8 x 4 1/2-inch loaf pan sprayed with cooking spray. Repeat instructions #7 - #10 with other half of dough. Cover both loaves with plastic wrap and let rise in a warm place one hour or until doubled in bulk. Sprinkle the tops of the risen loaves with cinnamon and sugar, and place in a preheated 375 degree oven for about 30 minutes. Halfway through baking, check the tops of the loaves. If they are getting too brown, cover with aluminum foil for the remainder of the bake. Remove from oven and allow to cool 10 minutes in pans before removing and letting cool on a wire rack. I would just like to write this letter to express my congratulations on your marriage. Never was a finer couple brought together, creating the most amazingly sweet taste combination ever invented. I appreciate your willingness to be duplicated in multiple forms - on top of buttery cookies, on fried churros and now, in the swirl of my braided loaf. You are too kind and generous to allow so many of us to take advantage of your unparalleled deliciousness. Blessings on your future. It's true - never was there a better combination created than cinnamon and sugar (though peanut butter and chocolate is definitely in close competition for first place). And it's so versatile, too. The snickerdoodle has no monopoly on the cinnamon and sugar industry. The proof? Cinnamon Sugar Braided Loaf. Braided loaves are always a mystery to me - they're difficult to manipulate into a braid, and the braid itself isn't really a braid, but rather two pieces of dough twirled around each other. You could call it a rope loaf, then, but "braid" sounds so much yummier. And it's a better word for representing the result of braiding a loaf -- a thin line of potent flavor embedded, or braided, in a cakey expanse of sugary white bread. This loaf can be as strong or as mild in flavor as you prefer. A word of caution, though: Always use more sugar and cinnamon than you think you'll need. What might look like a heap of the ingredients on the dough slab will turn out to be only a sliver of a line throughout the loaf. 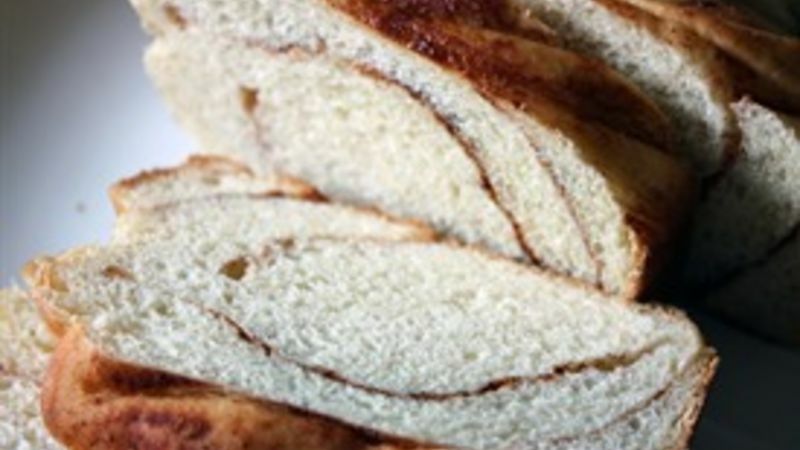 Some may like it this way, but I'm partial towards a loaf packed with that sweet cinnamon flavor, so I probably use about a tablespoon of cinnamon and sugar each for the inside of the bread, and about half that on top. Also, don't be shocked when you pour a goopy, liquid mass on your countertop while making the dough. It's the best way to slowly incorporate flour without using too much and thus toughening the dough. And don't be discouraged if you have trouble braiding together the pieces -- a little imperfection never takes away any of the taste. Cut this loaf into thick slices and use it to make cinnamon French toast, or cut into cubes and use for your next bread pudding. Or, eat a piece as is. You too will be writing letters to Cinnamon and Sugar in due time.